By exposing discourses and structures that organize bodies and shape subjectivities, Park McArthur addresses the materialization of the politics of circulation and mediation of individual and collective bodies. McArthur's artistic operations occupy border zones and spotlight the tensions and negotiations of power between public and private, between one body and another. By exposing this system, the artist introduces tension to discourses of accessibility, inclusion, protection and care. 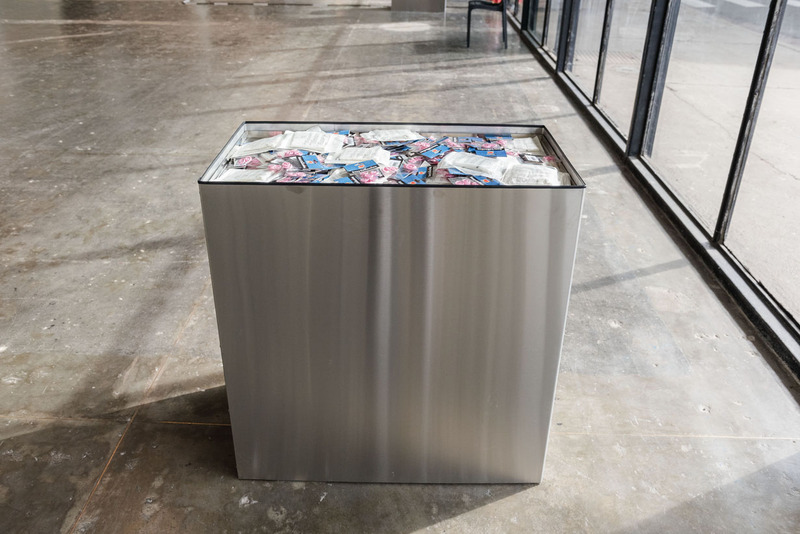 For the 32nd Bienal, McArthur created Sometimes You’re Both (2016), comprised of stainless steel columns inside and around the pavilion containing items that mediate intimate contact – latex gloves and finger protectors. Varying in depth, the columns regulate access according to the visitors’ physical conditions. Items contained in the installation are available to the public and will not be replaced. All that will be left is the structure that dispenses them, like a totem open to spontaneous uses. Ideas of encounter and separation are central to this installation, concerning the relationships of the body and its fluids with industrial, antiseptic material, and between one body and another, the institution and the park, and the work and the public.